You will be amazed at how much more engaged in our political process you become, when you make a simple $5.00 contribution to a candidate, you support. This month (July 2016) I will begin following the upcoming election cycle at the national, state, county and local level. As I often remind many of my friends, I am a Blogger not a reporter. I Post my thoughts and opinions, you will rarely see any "Breaking News" in my Posts. 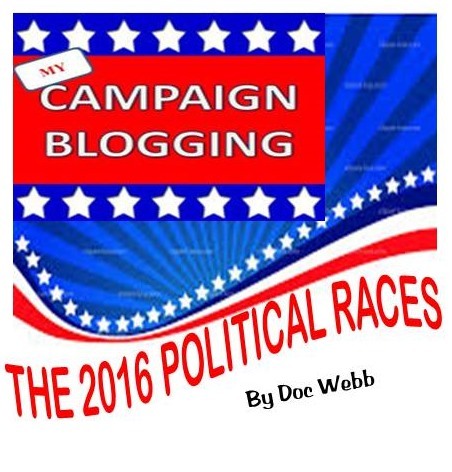 In this election cycle, as in the past, I will periodically contribute to political campaigns, PACs or issues. I think it is important that as a reader, you can easily see when I am commenting about a campaign or candidate where I have contributed. E-mail Doc at: mail to: dr.gwebb@yahoo.com. Or send me a Facebook (Gene Webb) Friend request. Please comment below, and be sure to share and Like on Facebook. The tag line will be as shown below with "Disclosures" added. 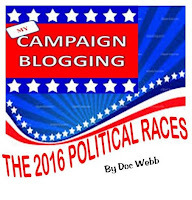 As I contribute to various campaigns, the campaign or candidate will be listed. These contributions are not ringing endorsements, and I frequently disagree on specifics with those I have supported and agree with those whom I have not. I would encourage you to contribute to a candidate or cause you support. Today virtually all campaigns have a WEB site where it is easy and secure to make a contribution. The amount really is not that important, but you will be amazed at how much more engaged in our political process you become when you make a simple $5.00 contribution to candidate or a cause you support. Running a campaign, whether it is for city council or president of the United States is an arduous task. Most candidates will tell you they are more inspired by the number of names on the contributor list than the numbers beside the names. Thank you for the time you invest in reading what I Post. I deeply appreciate all of your comments, Tweets and e-mails. It will be an interesting election cycle with just a few months until the Presidential election. I hope I pique your interest, make you smile, raise your awareness and move you to comment in the coming weeks. E-mail Doc at mail to: dr.gwebb@yahoo.com or send me a Facebook (Gene Webb) Friend request. Please comment below, and be sure to Like and share on Facebook.